Visit the website of St. Anthony's community and learn about our initiatives. We guarantee that personal information transmitted to us will not be indicated nor communicated to third parties for any reason whatsoever. 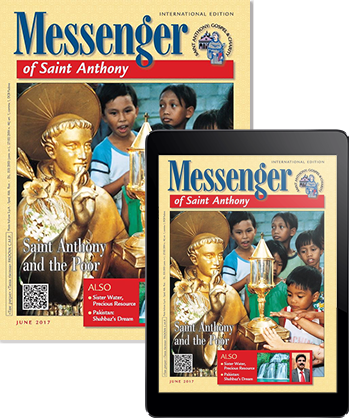 They will be used to inform you about any initiatives of the Friars of the Basilica of St. Anthony and of the Messenger of St. Anthony. In compliance with the Italian Law n° 196/2003 (protection of privacy), you may ask at any time to see, modify or cancel the data that you have given us by writing to our Customer Service, Messenger of St. Anthony, via Orto Botanico 11 - 35123 - Padua, Italy.